Hi you all !! I have been away for some time due to much things that happened this summer. But I am trying to make a book of my art, more for myself....and as I told my own story about my drawinghistory, I remembered that I did make paintings like this when I was about 20 years old. My parents had only one book on the shelve from an artist: Esscher. 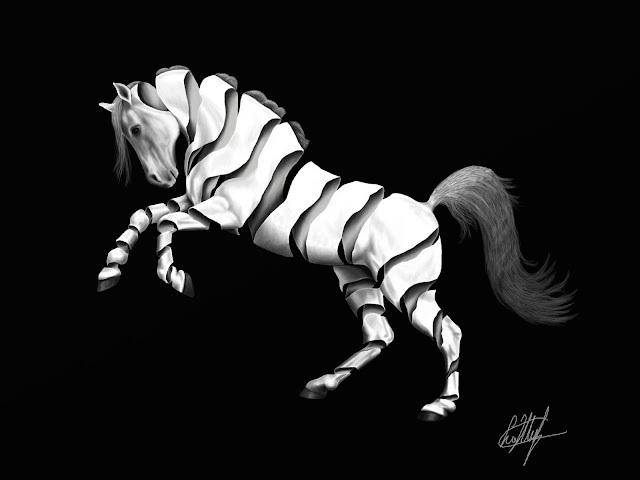 So here is a reproduction from that period made with ArtRage. I have no idea where the originals are..... I hope you like it. Not just I like it, very much I like it. Extremely good job. Very labor intensive. How long did it take? Last edited by kreksofin; 10-11-2011 at 11:43 PM. A Moebius horse I guess! An astounding creativity here under Enscher inspiration. Very well executed too. This painting took me about 15 hours I think. Half way I realized there was a more easy way to do this by painting the whole horse first and then erase out the parts to make the backside. But i did'nt. 24 years ago I painted this with white wallpaint on black paper and then made the details with a pencil afterwards....haha. Thanks for the great compliments, I still do not see myself as having a talent but it is so nice to hear. Now I am going to think back in the past to try and remember what else I did back then and reproduce that in Artrage....It is fun ! Welcome back Vanity its good to see you. This is fabulous work and so different. Looking at it long enough the horse seems to move and I love it. Welcome back Vanity, we have kind of missed you being around with all your gorgeous paintings. I like this one a lot, very creative. Love it. Great work ! !